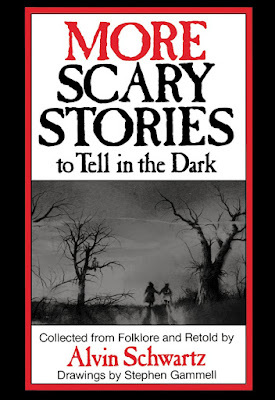 AuthorQuest: My Kindertrauma: Wonderful Sausage from "More Scary Stories to Tell in the Dark"
My Kindertrauma: Wonderful Sausage from "More Scary Stories to Tell in the Dark"
How about a change of pace? Let's hit the pause button on films and go for some literature. Now, I've never found reading very scary. It lacks the visual punch and timing. The best you can get is a sense of dread. I know some people say that when your imagination takes over, things are scarier. But for me, I know I have nothing to fear from my imagination -- it's in my head, the monsters can't affect me there. It's only as scary as I can make it. Lovecraft can't stop me from giving Cthulhu a flowery hat like Mrs. Nesbitt. But sometimes at night, when the shadows are on the wall, and something pricks you just right... ideas can't be controlled so easily. The right combination of gross-out, terror, and fear leads to nightmares. 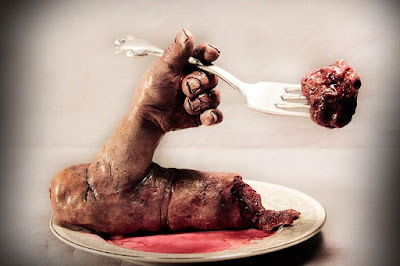 Case in point: "Wonderful Sausage" from More Scary Stories to Tell in the Dark. This was another procurement from my mom's college horror class. Why do I subject myself to these things? Was it a way to try and get closer to my mother? Was I just warped to begin with? Were sources of trauma becoming sources of arousal for me -- the product of living a quiet, boring suburban life and this was my way to get safe thrills? I'll never know. Anyway "Wonderful Sausage" combines child abduction (which I touched on in Poltergeist III) and cannibalism. There's also the horror of everyone enjoying it. I think something in my German roots was also attracted by the sausage. The fact that there's little explanation behind the killer's motivation makes it more intimidating. There's no introspection, no thinking moments (as one expects from a campfire tale), it's just a thing that happens -- a guy snatches up men, women, children, puppies, kittens (not my cat! ), kills them, and makes them food. I remember one night laying in my bed, trying to sleep. Insomnia is a terrible thing, and I often had it. Usually a result of a fast and deep mind, made worse when toxic thoughts run around your head. And the shadows on your wall start to look like a butcher holding a limb over a sausage grinder. It was the same sort of thing that happened after Creepshow -- my window looks like the Creeper is standing there, like a hallucination. Half-there, half-not.